As reported on Global News, a seven-year effort to increase the city’s stock of affordable housing at 7 Wright Cres. may finally be moving ahead. The former nun’s residence was purchased by the City of Kingston in 2012 for $1 million, but it has remained undeveloped ever since. 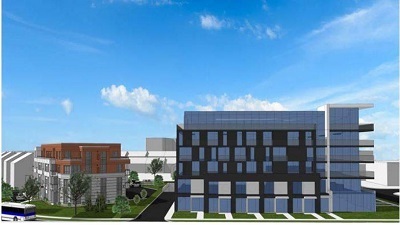 However, city staff are now recommending that a new, two apartment building development proceed on the two-acre site through a partnership with privately-owned CJM Development (Caraco) and the non-profit Kingston Frontenac Housing Corp. (KFHC). Under the deal, the city will sell 1.3 acres to CJM for $925,000 and transfer the remaining 0.7 acres to KFHC, which is valued at $500,000. In addition, CJM will pay the estimated $175,000 cost to demolish the existing convent building. The proposal to build a total of 160 residential apartment units is much lower than the 215 units originally planned for the property. However, the original two apartment deal involving CJM and Town Homes Kingston, another non-profit housing organization, was abandoned after Town Homes ran into financial difficulties to proceed with its portion of the development. The city is currently overseeing a strategy to merge Town Homes and KFHC into Kingston’s single-largest affordable housing provider.